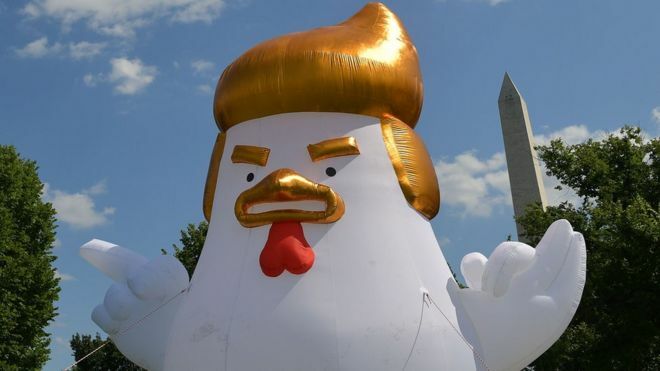 An inflatable chicken with a golden coiffure has appeared near the White House in protest at Donald Trump's "weak" and "ineffective" leadership. The 30 ft (9m) tall bird, referred to as "Chicken Don", stands between the official residence of the US president and the famous Washington Monument. Owner Taran Singh Brar said the prop portrays a president who is "afraid". But some Twitter users were not impressed, with one dubbing the stunt "pathetic". In a video posted on social media on Wednesday, activist and documentary maker Mr Brar said he hoped to "bring awareness" to what he said was a "bad and destabilising" US president. "We are out here to criticise our president for being weak and ineffective as a leader," he said in the footage posted on Twitter, adding that Mr Trump also "seems afraid" to release his tax returns. "He seems afraid to stand up to Putin and now he's playing a game of chickenwith North Korea," Mr Brar said. Permission to set up the inflatable fowl, which was funded through the crowdsourcing website GoFundMe, had to be obtained from the US Secret Service, according to local media. In April, the large bird appeared at marches across the US as demonstrators called on Mr Trump to release his tax returns. The balloon was manufactured in China following the success of a Trump-like rooster designed as a prop to celebrate the Chinese New Year in January. The inflatable's arrival has divided opinion on social media, with Twitter users at odds over whether the stunt was "pathetic" or "cute". The topic quickly gained momentum and the hashtag #TrumpChicken was trending in the US on Wednesday. Trump #TaxMarch Chicken takes up roost near the WH. Trump IS chicken. Scared. Running. "Not a comment on Trump or his presidency, but I just kind of love the inflatable chicken w/Trump hair. It is really cute!" wrote Eva Ulrich. Another Twitter user, Scott Presler, wrote: "President Trump tells nuclear power North Korea there will be 'Fire & fury' and democrats inflate a chicken? Insanity." BREAKING: Approval rating for inflated #TrumpChickennow at 98%. "The left would rather spend $1300 on a #TrumpChicken, than use that money to feed the homeless. The obsession continues," wrote Scott. This argument was countered by Eugene, with a tweet that simply read: "Now we have a real President. #TrumpChicken." Meanwhile, Bryce Tache‏ said that although the stunt was "juvenile", this was not necessarily a bad thing: "Yes, #TrumpChicken is juvenile. But he makes me ridiculously happy. I needed him today. What about you?"